Former Somalia President Sharif Sheikh Ahmed has declared that he will once again offer himself for the country’s top seat. Sheikh Sharif served as the Head of State in 2009-11. He said the inability of the current leadership to restore peace and security in the Horn of Africa country has compelled him to make a come-back to politics. Speaking during an interview with The Standard, the ex-President said during his tenure he successfully waged a war against Al Shabaab militants, noting that after he left office, the members of the extremist group made a resurgence. Sheikh Sharif spoke a week after the 14 Riverside Drive terror attack, explaining that if he is elected to office, he will lobby the international community to strengthen the capacity of his country’s security forces. Members of the militia still control large parts of rural Southern and Central Somalia. The group which claimed responsibility for the January 15 attack in Nairobi has in the past carried out high-profile attacks in Somalia’s Mogadishu and elsewhere in the country. Next year, the Horn of Africa nation will conduct historic general elections. This will be the first time the country will hold a one-person-one-vote poll since the country experienced a military coup in 1969. The country’s geo-strategic importance and instability contribute to the high stakes of the upcoming elections. Sharif revealed that he has already formed a political party on whose ticket he will use to make a second stab for the top seat. The party, Himilo Qaran (National Vision), was unveiled two months ago. “I confirm that I will be the presidential flag bearer of Himilo Qaran in the 2020 elections. I feel the current leadership has given the Somali people a raw deal. I want to unite Somalia and make it stronger,” he said. Before ascending to the presidency, Sharif considered by many people as the ‘Father of Modern Somalia’ since he took over a country that had collapsed for close to two decades, was the leader of the Islamic Courts Union. Under his leadership, the Transitional Federal Government succeeded in driving out Al Shabaab from Mogadishu and the surrounding areas with the help of AU forces. The administration of Sharif, who was Somalia’s 7th President, is also credited with developing the country’s Constitution and setting up key institutions such as the police, military and judiciary. After his exit from office, Hassan Sheikh Mohamed took over the leadership rein, ruling from 2012 to 2017. The current President Mohamed Abdullahi Farmaajo was sworn into office in February 2017. His four-year term will come to an end next year. The politician seemed to have no kind words for his two successors, noting that their performance has been below par, and the country has not made much progress. 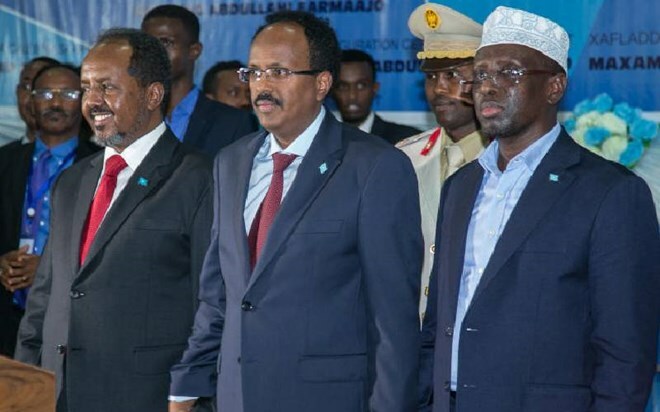 All indications are that Farmaajo will seek to defend his post, since he has registered a political outfit – Nabad iyo Nolol (Peace and Life) party. Ex-President Hassan is also associated with the Union for Peace and Development (UPD) party. The three politicians considered to be the front runners will seek the votes of 275 members of the House of the People (Parliament) and 54 Senators (Upper House).